There's nothing more refreshing, after a long, cold Niagara winter, than seeing those bright, cheerful shoots that quickly turn into vibrant flowers in the spring. For a little post-winter cheer next year, plant some bulbs in your garden! Another fun thing about bulbs is that you tend to forget about them during the time they're dormant, so that when they begin to emerge in the spring, it can be a happy surprise! 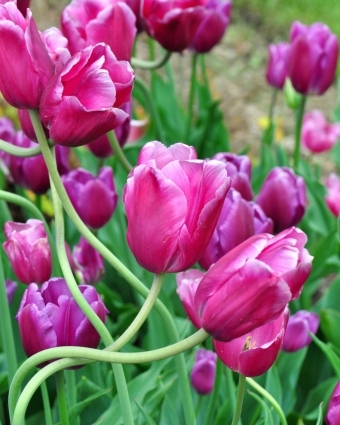 For bulbs that turn into beautiful flowers in the spring and summer, follow the tips below. Bulbs grow best in a sunny spot. Make sure the area that you are planting the bulbs is well-drained, as bulbs cannot stand in water. Before you dig into the soil, place your bulbs around your garden in odd number clumps. Clumps of 7 or 9 bulbs will make a bigger impact than single bulbs sporadically planted around your garden. Dig a hole (for ease you can use a bulb planter) about 2-3 times the height of the bulb itself deep. Sprinkle some bonemeal and a low dose of granular fertilizer in the hole with your bulbs. If squirrels are a problem for you then use bloodmeal instead. Because bloodmeal is high in nitrogen you won't need to use any extra fertilizer. Plant the bulbs at least 6 inches deep, this helps to prevent squirrels from digging them up. Plant the bulbs firmly with the pointed ends facing up, either singly or in groups of 7-9 for a bolder effect. Back fill with soil and rake over smoothly. Bulbs do not need to be watered in like other plantings, because they are dormant and they will be until warmer weather comes along. While tulip and daffodil bulbs need to be planted in the fall for Spring colour, there are a number of bulbs that can be planted in the spring. Gladioli, lilies, canna and dahlia bulbs should be planted in the spring for a dramatic summer show. If you have more questions about planting bulbs, or if you could use some guidance as to which bulbs to plant, and where, drop by for a visit at the Country Basket Garden Centre – we'd love to help!